STEP 1. Order four copies of Patrick Lencioni's new book, The Ideal Team Player. STEP 2. Hand-deliver the book, along with a Starbucks card, to each of my direct reports, with this assignment: "Invest up to four hours at Starbucks this week—and read this important book. It's likely the most team-transforming exercise we’ll do together this year." STEP 3. 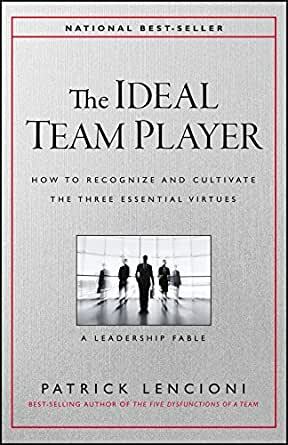 Schedule a half-day off-site team meeting (for next week) to discuss "How to Recognize and Cultivate the Three Essential Virtues” (the book’s sub-title). STEP 4. Facilitate the senior team meeting (or invite a facilitator to do the honors) and get buy-in and commitment (a la Lencioni's pyramid in The Advantage: Why Organizational Health Trumps Everything Else In Business). Assign next steps. STEP 5. Step back and watch your culture transform as you articulate three virtues: Humble, Hungry, and People Smart. That would make a great poster." So, in search of more acceptable lingo and meaning, the leadership triad lands on Humble, Hungry, and Smart. Lencioni defines these virtues in the final 60 pages (The Model and application), worth the price of the book. HUMBLE: "Great team players lack excessive ego or concerns about status." He adds, "Humility is the single greatest and most indispensable attribute of being a team player." HUNGRY: "Hungry people almost never have to be pushed by a manager to work harder because they are self-motivated and diligent." SMART: "Smart simply refers to a person's common sense about people." Caution #1: What if you settle for just one out of three? Or, if you're fortunate, two out of three virtues? After all, no one's perfect. Lencioni: "What makes humble, hungry, and smart powerful and unique is not the individual attributes themselves, but rather the required combination of all three." What About 2 Out of 3? “The next three categories that we'll explore represent people who are more difficult to identify because the strengths associated with them often camouflage their weaknesses. Watch out for the banana peel when you’re interviewing a candidate without humility. "Unfortunately, because they are so smart, Skillful Politicians are very adept at portraying themselves at being humble, making it hard for leaders to identify them and address their destructive behaviors." Lencioni urges: Don't hire unless you and your team members can positively affirm a three-for-three person. I know. It's not easy, but read the book, and you'll be absolutely convinced. Lencioni packs the last 60 pages with highly practical insights, warnings, and next steps. He lists very practical ways to assess your current team members and what to do with the 0-for-3, 1-for-3, and 2-for-3 people already on your team. He gives solutions, including a helpful self-assessment with 18 questions. Effective organizations—whether they’re multinational corporations, professional sports franchises, or local churches—practice teamwork. When people work together on a common goal, they achieve more than they could do individually and experience a measure of personal satisfaction. When people work against one another, however, the result is organizational ineffectiveness and personal frustration. In his 2002 bestseller, The Five Dysfunctions of a Team, Patrick Lencioni outlined five ways teamwork goes awry: absence of trust, fear of conflict, lack of commitment, avoidance of accountability, and inattention to results. While that book identified the interpersonal dynamics of effective teams, it did not identify the personal qualities of effective team members. Lencioni’s new book, The Ideal Team Member, picks up where Five Dysfunctions left off and outlines three essential “virtues”: An ideal team member is humble, hungry, and smart. Humility comes first because it is “the single greatest and most indispensable attribute of being a team player.” Humble team players are not “overtly arrogant,” of course, but they do not “lack self-confidence” either. Rather, quoting C. S. Lewis, Lencioni writes, “Humility isn’t thinking less of yourself, but thinking of yourself less.” Humility makes collective action possible. Without it, teams don’t work effectively, because each member is either out for themselves ( due to overt arrogance) or unable to propose solutions (because of lack of self-confidence). “Hungry people are always looking for more,” writes Lencioni. They are “self-motivated and diligent.” For a team to work effectively, each team member must proactively contribute to the overall effort. No slackers are allowed. Smart doesn’t pertain to “intellectual capacity,” though it’s similar to emotional intelligence. Lencioni defines it as “a person’s common sense about people…the ability to be interpersonally appropriate and aware.” Ideal team members are people-smart. Although Lencioni wrote The Ideal Team Member for the secular business world, my description of its contents should convince ministers that it has application to the work of local churches as well. (Indeed, Lencioni—a devout Catholic—notes that Jesus Christ is the “most compelling example of humility in the history of mankind.”) The humble-hungry-smart model gives senior pastors and ministers who lead volunteers valuable insights into who to hire, how to assess their performance, what can be done to develop them when they lack one or more of the virtues, and how to embed those virtues in a church’s organizational culture. Consequently, I highly recommend this book to ministers and ministry leaders. 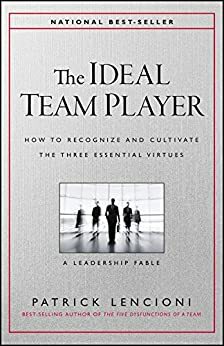 One final note: As with The Five Dysfunctions of a Team, The Ideal Team Player begins with what Lencioni calls “a leadership fable.” He tells the story of the CEO of a family-owned building company who discovers these three virtues in the course of taking over the reins of the company from his uncle. Only after telling the fable does Lencioni describe the humble-hungry-smart model in propositional terms. This narrative way of approaching the subject shows before it tells. This makes Lencioni’s points concrete and easy to understand. The show-then-tell approach is also, it seems to me, a great way to preach…though that is a subject for another time.